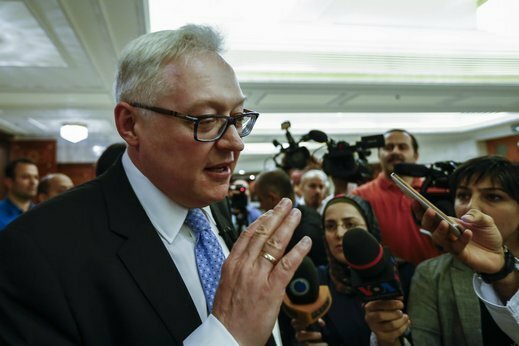 Ryabkov’s response came after Vasily Nebenzya, Russia’s Permanent Representative to the United Nations, yesterday announced that Moscow is proposing a new report by UN experts and the Organization for the Prohibition of Chemical Weapons (OPCW) on chemical attacks in Syria. “We have begun to prepare a new document, which has a comprehensive technical character”, said Russian press secretary Fyodor Strzhizovski, adding that it is necessary to conduct such study using experts from different institutions. “It surprises us once again that Western news agencies are shamelessly publish quotations directly from an internal document of the UN Security Council”, he added. “The group of international experts is convinced that the Syrian authorities are responsible for the release of sarin gas in Khan Sheikhoun in Idleb province, AFP reported earlier. The statement came after the Joint UN Security Council and the Organisation for the Prohibition of Chemical Weapons Inquiry Mechanism submitted a report to the Security Council on Thursday evening, which included the results of the investigation into the alleged use of sarin gas in the Syrian town of Khan Sheikhoun on April 4, and the use of mustard gas in the town Oum Al Hosh on 15th and 16th September 2016. “Once again we see an independent inquiry confirming the use of chemical weapons by the Assad regime”, said Nikki Haley, the US ambassador to the United Nations, while commenting on the report. “The UN Security Council must send a strong message that it does not tolerate the use of chemical weapons by any party and must assure its full support to impartial investigations”, she added. “The Secretary-General of the United Nations Antonio Gutteres expressed his full confidence in the professionalism, objectivity and impartiality of the Joint UN-OPCW Inquiry Mechanism”, Deputy Spokesman for the Secretary-General Farhan Haq said. The UN Security Council and OPCW unanimously established the Joint Investigative Mechanism in 2015 and renewed its mandate for another year in 2016. Its current mandate expires in mid-November. Russia, however, rejected the extension of the mandate, stressing that while it was not opposed to the extension as such, it nonetheless had to take a hasty decision as regards the matter, namely after discovering “fundamental problems” in the work of the joint mechanism. Russia’s permanent representative to the United Nations,Vasily Nebenzya, said earlier this week that Moscow would consider reviewing the extension of the mandate with amendments after discussing the report on Thursday. It is noteworthy Syria agreed to destroy its entire stock of chemical weapons back in 2013 already, following a deal brokered by Russia and the United States. The Syrian government has repeatedly denied the use of chemical weapons during the entire war, which has been going on for more than six years now.